Many times, investors are uncertain about using standalone vs consolidated financials in their stock analysis. Over time, we have received a lot of queries from investors in the Ask Your Queries section asking us whether they should use standalone vs consolidated financials in situations like overall financial analysis, calculating price to earnings ratio (PE ratio), debt to equity ratio (DE ratio), analysing investments of the companies etc. The current article answers these queries with examples of real life companies to illustrate the usage of standalone vs consolidated financials. The article also helps an investor with the steps to merge the standalone and consolidated financials for long term historical analysis in companies, which have only recently started publishing consolidated financials. Standalone financial statements represent the financial position and the performance of the company as a single entity without taking into account the financial position and the performance of its subsidiaries etc. Let us assume a case of a company (ABC Ltd) whose primary business is to invest in other companies and this company may not have any business operations of its own apart from the investments done by it in other companies (subsidiaries of ABC Ltd). In such a situation, the standalone financials of ABC Ltd would not show any significant financials except the small amounts of dividend or interest income that it might have earned from its subsidiaries. Even if the subsidiaries of ABC Ltd have hugely profitable businesses, it will not be reflected in the standalone financial performance of ABC Ltd. This is because the standalone financials include only the business performance of only ABC Ltd while ignoring the business performance of its subsidiaries. An investor will be faced with the same constrained situation when she analyses the standalone balance sheet of ABC Ltd. The standalone balance sheet of ABC Ltd will show only the debt taken by ABC Ltd without considering any debt, which might have been taken by its subsidiaries. If the subsidiaries have taken significant amount of debt, then it will not be reflected in the standalone balance sheet of ABC Ltd. Therefore, if an investor analyses only the standalone financials of ABC Ltd, then she may not come to know that the subsidiaries of ABC Ltd may be under heavy debt burden. To overcome such situations of inadvertently missing out on critical financial position and business performance, investors analyse consolidated financials of the companies. Consolidated financial statements of a company represent the completed financial position and the business performance of the company including its subsidiaries. As a result, the consolidated financials of ABC Ltd will include the sales done, profits made and the debt taken by all the subsidiaries of ABC Ltd. The consolidated financials of ABC Ltd will show the complete financial position of all the subsidiaries of ABC Ltd whether these subsidiaries have taken a lot of debt or have made a lot of investments, it will be reflected in the consolidated financials. Similarly, the consolidated financials of ABC Ltd will also show the complete business performance of all the subsidiaries of ABC Ltd whether the subsidiaries have made significant profits or significant loss, it will be reflected in the consolidated financials. Standalone vs Consolidated Financials: Which one should be used in Stock Analysis? We believe that investors should always prefer the use of consolidated financials in their stock analysis. This is because the consolidated financial statements show the complete picture of the financial position and business performance of any company. 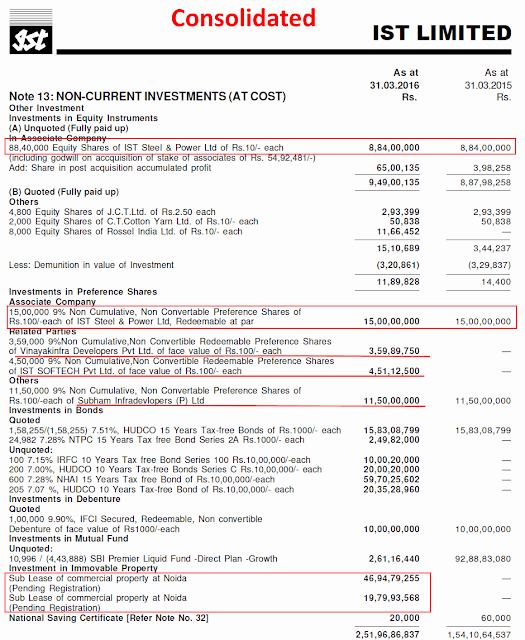 If the investor ignores consolidated financials and only analyses standalone financials of any company, then she may make erroneous decision as illustrated in the following hypothetical example. Let us assume that the company ABC Ltd only makes investments in subsidiaries and it does not have any other business operation of its own. The only income ABC Ltd shows in its profit and loss statement (P&L) is the dividend income received by it from its subsidiaries. Further, for illustration, let us assume that all the subsidiaries of ABC Ltd are making huge losses. However, somehow, these subsidiary companies are able to survive by taking huge loans from banks etc. and are using these loans to declare dividends for its shareholders like ABC Ltd. If in such a situation, while analysing ABC Ltd, an investor considers only the standalone financials of ABC Ltd, then she will find that ABC Ltd has very little debt and is showing profits due to the dividend received from its investments in its subsidiaries. The investor will completely miss out the deep problems existing in its subsidiaries, which will come to haunt ABC Ltd in future. However, if the investor analyses the consolidated financials of ABC Ltd, then she would immediately come to know that ABC Ltd (as a group including its subsidiaries), is making huge losses and has a huge loan to repay. The investor would immediately become aware of the problems being faced by ABC Ltd. Therefore, after analysing consolidated financials of ABC Ltd, the investor may take a better informed investment decision. Standalone vs Consolidated Financials: Should we completely ignore Standalone Financials? Until now, an investor would have realised that the consolidated financials present the overall financial position and the business performance of any company. Therefore, investors should prefer consolidated financials over standalone financials while making their investment decisions. However, it raises an question about the utility of standalone financials. 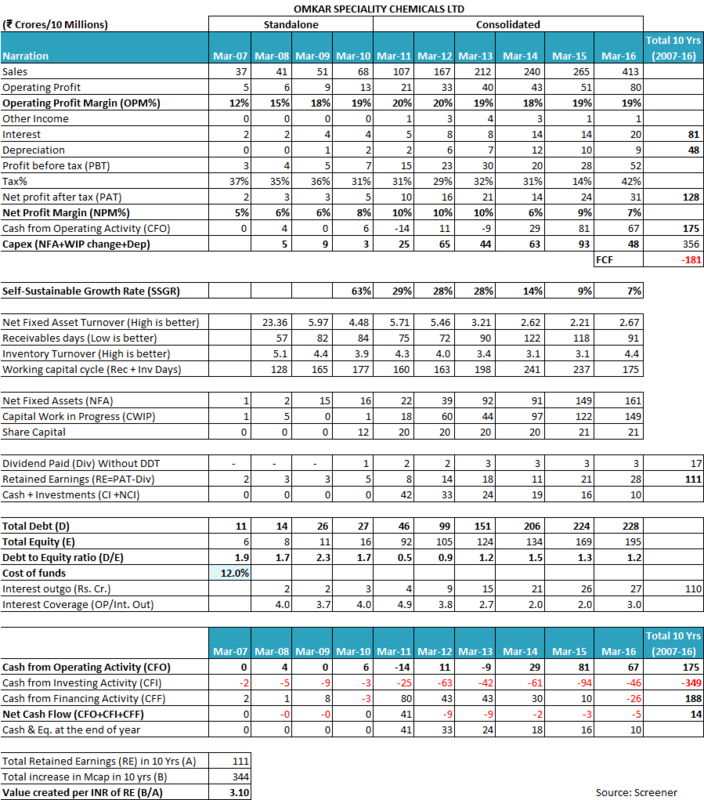 Should an investor analyse standalone financials at all? Or she should completely ignore standalone financials and focus only on consolidated financials. We believe that even though the primary focus of investor should be on the consolidated financials of the company, she should study the standalone financials of the company and compare the standalone financials with consolidated financials to get deeper insights into the business decisions of the promoters/management. A comparison of standalone vs consolidated financials provides a lot of deeper insights into the financial position of the company and the business decisions of the promoters. We will analyse a few real life companies to understand the insights about receivables, investments etc, which can be gained by investors on analysing standalone vs consolidated financials. If an investor studies the comparative receivables position of the Torrent Pharma at both consolidated and standalone level, then a lot of insights can be gained in the company’s actions. It indicates that the majority of receivables owed to the standalone entity of Torrent Pharma for more than 6 months are from its own subsidiaries, on account of sales of products from Indian unit of Torrent Pharma to its subsidiaries. The above observations would highlight to the investor that the subsidiaries of Torrent Pharma in USA, Brazil and Romania are not remitting money to the Indian unit, despite collecting them from their end customers in respective geographies. Moreover, on account of non-receipt of money from its overseas subsidiaries, Torrent Pharma has to raise incremental debt over and above what it required for funding its acquisition of Elder Pharmaceuticals Limited, which could have been avoided to that extent (about ₹200 cr. which is due for collection for more than 6 months from overseas subsidiaries). 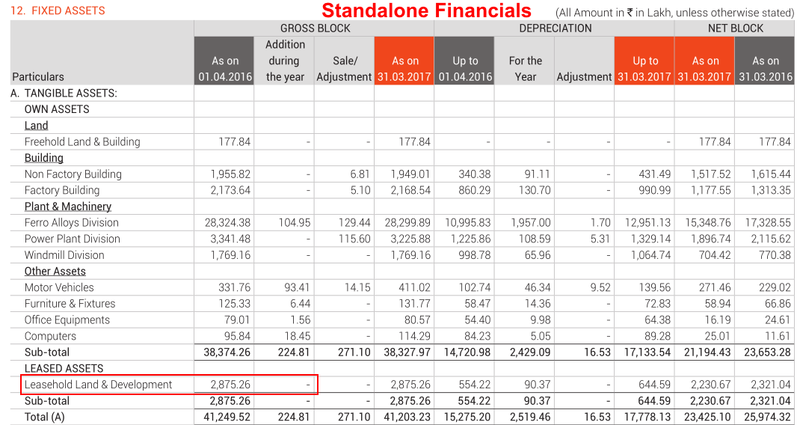 The above comparison of standalone vs consolidated financials indicates that the investor should try to understand in-depth the reasons why Torrent Pharma is keeping the money parked in overseas locations, while it needs the money in India to meet its liabilities. The comparison of standalone & consolidated receivables position of MBL Infra at March 31, 2016, indicates that more receivables are outstanding at the standalone level than at the consolidated level. It indicates that the money received from third parties by its subsidiaries is not being paid by subsidiaries to the holding company. Investors would note that recently, the lenders of MBL Infra have initiated bankruptcy proceedings against the company under the bankruptcy law in National Company Law Tribunal (NCLT) and its promoters have provided a resolution plan, which seems to be accepted by the lenders. IST Ltd is a company operating in auto-ancillary industry. However, most of its market value arises from its highly valuable subsidiary: Gurgaon Infospace Ltd (GIL). GIL owns a land parcel in Gurgaon on which a commercial building (Unitech Infospace, Sector 21) has been made and leased out by Unitech Ltd. As a result, GIL receives significant amount of money for its share in the rent paid by the tenants in the commercial building. As GIL is only earning rent due to its ownership of land and does not have a lot of operating expenses, therefore, it is expected that it will have very high profitability and it would generate significant cash surplus every year. It becomes essential for investors of IST Ltd to know what GIL is doing with its cash. However, upon analysis of the FY2016 annual report of IST Ltd, an investor notices that the annual report does not contain the detailed financial position of Gurgaon Infospace Ltd. 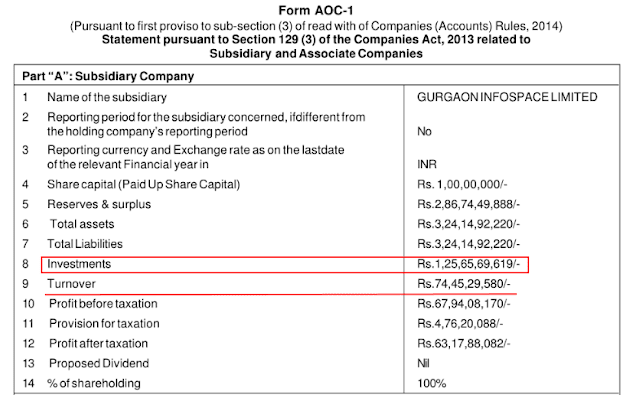 The annual report of IST Ltd only contains the summary of financials of Gurgaon Infospace Ltd.
An investor would notice that Gurgaon Infospace Ltd has accumulated a lot of cash and has made investments of ₹125 cr. It becomes paramount to analyse the avenues where the cash has been invested as it would indicate whether the management has been using the cash conservatively or is splurging it at the cost of minority shareholders of the parent entity. 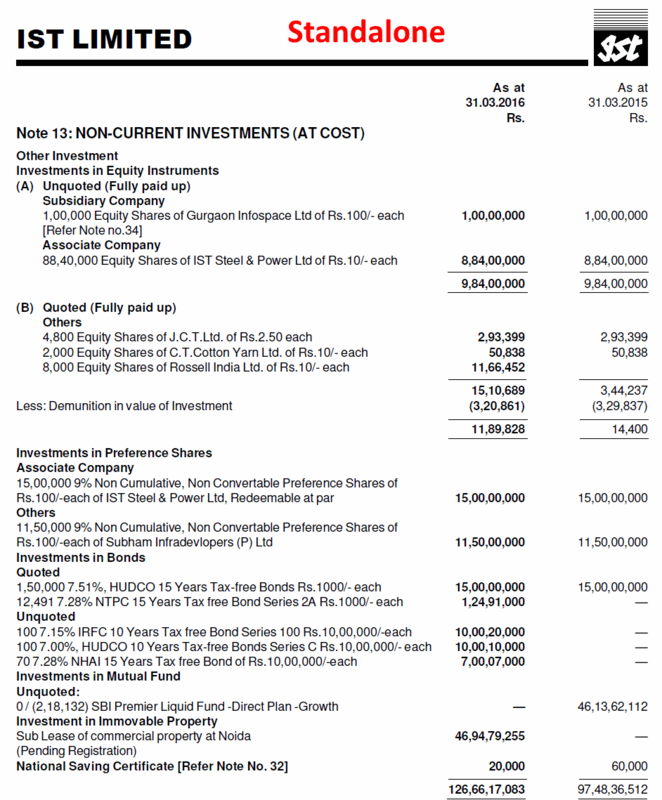 An investor can find out the avenues of these investments by comparing the details of non-current investments of IST Ltd in consolidated financials (which includes the investments done by Gurgaon Infospace Ltd) and the non-current investments of IST Ltd in standalone financials (which exclude the investments done by Gurgaon Infospace Ltd). This assessment becomes essential to understand the manner in which the promoters have utilized the cash available with the company. It indicates that primarily the money has been invested in debt instruments (bonds/debentures/mutual funds) etc. However, the management has also given about ₹8 cr. of cash to related parties, which is a cause of concern as despite being cash rich, the management has not been paying dividends to shareholders. Investors may need to analyse it further to take a better investment decision. An investor would acknowledge that even if the annual report of the listed company IST Ltd does not contain detailed financial position of its important buy unlisted subsidiary, GIL, still investors may get a lot of insights into its financial position by comparing standalone vs consolidated financials. Let us use our learning to find out the amount of cash infused by Maithan Alloys in one of its subsidiaries, Anjaney Minerals Ltd and what did Anjaney do with the money. An analysis of FY2017 annual report of Maithan Alloys, page 105, will indicate that it has increased investments in its subsidiary Anjaney Minerals Ltd by about ₹3 cr, which is the amount of the cash infused by Maithan into Anjaney. An investor would notice from our discussion above that listed companies do not disclose detailed financial position of their unlisted subsidiaries in the annual report. Therefore, to find out the utilization of cash/investments made by the subsidiary companies, an investor needs to resort to comparison of standalone vs consolidated financials. In case of Maithan Alloys, upon comparison of standalone vs consolidated financials, an investor gets to know that probably Anjaney has used the cash it got from Maithan Alloys to acquire leasehold rights on the land. This acquisition of the leasehold rights on land by Maithan Alloys in the subsidiary is visible upon comparative analysis of the fixed asset schedule in the consolidated financials and the standalone financials of FY2017 annual report. An investor would notice that addition of leasehold land & development in the gross block of about ₹3 cr. is present in the consolidated financials but is absent in the standalone financials. Therefore, an investor would acknowledge that a comparison of standalone vs consolidated financials can help her find out the business strategy of any company, which it executes by acquiring different assets/investments in its subsidiaries, which may not be visible on the first level of analysis by the investors. 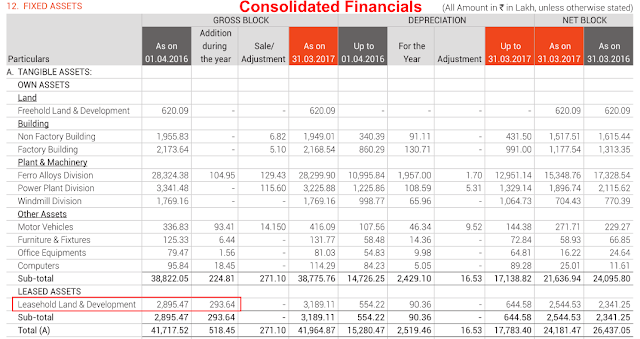 As mentioned above, while doing stock analysis, we prefer to analyse consolidated financials of companies. Moreover, we prefer to use the maximum possible years of past data, which is available for companies. We believe that at least last 10 years historical data should be studied. Many times, these guidelines present a tricky situation where a company, e.g. ABC Ltd. may have formed a subsidiary only a few years back (let’s assume 5 years back). So the company would have published its standalone as well as consolidated financials only for last 5 years. However, for the years previous to 5 years, the company would have published only the standalone financials. Therefore, many times, it raises doubts in the minds of investors about which financials should be studied in such cases. We believe that the aim of the investor should be to study the complete business picture of the company for any selected period. In the scenario cited above, for the period previous to forming a subsidiary, the standalone financials presented the complete business picture. Therefore, in the last 10 years data analysis, for the period previous to the last 5 years, we study the standalone financials. The company created its subsidiary 5 years back and has been reporting both standalone and consolidated financials for last 5 years and investors know that during these recent 5 years, the consolidated financials present the complete financial picture. Therefore, for recent 5 years, we analyse the consolidated financials. So to summarise the above scenario, in our historical analysis of 10 years for ABC Ltd, we study the standalone financials for initial 5 years and consolidated financials for the recent 5 year. How to use Screener.in Export to Excel feature to combine standalone and consolidated financials? Screener.in is a very popular website providing financial data of Indian companies. It provides past 10 year data of almost all the companies listed on Indian stock exchanges NSE and BSE. We can easily use the standalone and consolidated financial data provided by Screener in its export to excel files to do historical financial analysis for the companies like ABC Ltd cited in the discussion above. 1) Download both the standalone & the consolidated financials separately. 2) Copy the standalone financial data from the “Data Sheet” of the excel file(quarters, P&L, Balance sheet, cash flow, price, adjusted number of shares) for the particular years e.g. for FY2007, 2008, 2009, 2010 in case of Omkar. 3) Paste the data copied in the above step in the consolidated financial excel file in the columns for the years FY2007, 2008, 2009, 2010. Now the analysis sheet “Dr Vijay Malik Analysis” will contain all the calculations containing the standalone figures for FY2007-10 and consolidated figures for FY2011-16. In this way, we get the complete financial picture for last 10 years for the company with the relevant financials. Until now, in the current article, we have learnt about the differences between standalone and consolidated financials. We learnt that standalone financials contain only the financial position and the business performance of a single company without including the financial position and the business performance of its subsidiaries. Therefore, we learnt that if we focus only on standalone financials and ignore consolidated financials of any company, then we may take erroneous investment decisions. As a result, we believe that an investor should always prefer the usage of consolidated financials in her stock analysis. However, it does not mean that she should ignore standalone financials altogether. In the discussion above, we learnt about multiple real life examples where we got deeper insights into different aspects of business strategy of companies by doing standalone vs consolidated financials analysis. We saw examples of companies like accumulating receivables in overseas locations, making investments in the names of subsidiaries, impending financial stress in subsidiaries etc. All these examples highlight the importance of using both standalone and consolidated financials in the analysis. We also learnt about combining the standalone and consolidated financials in the historical financial data analysis. We saw the steps that we take to combine the standalone and consolidated financial data of companies provided by Screener.in in its Export to Excel feature so that an investor can conduct the comprehensive analysis of companies. Now let us proceed to enhance our understanding of the comparative usage of standalone vs consolidated financials by answering the important queries asked by investors in the Ask Your Queries section of our website. Can you please help me understand the difference between the standalone PAT/PBT/TO etc. with Consolidated? In case company reports Cons. PAT > Stand PAT – does the parent company owns the entire PAT and also liable for corresponding Capex? What happens in case subsidiary is also listed – how should the revenue and profits are shared? What number should be used by an investor to understand the health of the business? In case Cons PAT < Stand PAT or let’s say Cons PAT < 0 and Stand PAT > 0 what does this mean for the group company? Where and how to understand which numbers to take for the analysis? Looking forward to learning from you on this. 1) In case company reports Cons. PAT > Stand PAT – does the parent company owns the entire PAT and also liable for corresponding Capex? The consolidated PAT represents entire standalone PAT (i.e. parent company’s PAT) + the PAT of subsidiaries, JVs etc. in the proportion of the shareholding of the parent company in these entities. 2) What happens in case subsidiary is also listed – how should the revenue and profits are shared? What number should be used by an investor to understand the health of the business? For the parent company from the point of view of consolidation, it does not matter whether the subsidiary is listed or unlisted. In case the subsidiary is listed, it would mean that the share of parent would be less than 100% and the respective portion would be adjusted while arriving at the consolidated PAT. 3) In case Cons PAT < Stand PAT or let’s say Cons PAT < 0 and Stand PAT > 0 what does this mean for the group company? 4) Where and how to understand which numbers to take for the analysis? We advise that investors should use consolidated financial numbers to assess the complete business picture of any company. Hello Sir, I have a question on the financials reported by the Prabhat Dairy Ltd. In the recent Q1-FY2019 results (Source: BSE), they have reported that the standalone revenue is > consolidated revenue, but standalone PAT < consolidated PAT. Can you help me understand why that is the case? I was unable to figure it out. Ideally the consolidated sales are expected to be higher than standalone sales. The cases where standalone sales can be higher are those where hypothetically, a company supplies all its output (assume product A, ₹100/-) to its subsidiaries. Thereafter, the subsidiaries use product A as input for their sales and in turn sell their output (product B) in outside market. If the entire sale of product B is less than ₹100/- (assume ₹90/-), then we may have a situation where standalone sales is ₹100/- and consolidated sales is Rs. 90/-. This is because the sale of product A from parent company to its subsidiaries will be nullified while preparing the consolidated financials. However, investors would appreciate that in the above case, if the subsidiaries buy product A at ₹100/- and process it and then sell it as Product B at ₹90/-, then the subsidiaries as a whole will make losses and in turn the consolidated profit after tax (PAT) will be lower than Standalone PAT. Therefore, the case of Parag Dairy Ltd is unique. Moreover, there might be any special case of accounting changes/reclassification, where it might have to regroup certain items in their results. This might have led to this outcome of standalone sales being higher than consolidated sales and standalone PAT being lower than consolidated PAT. In the note no. 4 to consolidated financials at page no. 8 of their results disclosure document to BSE, the company has mentioned about reclassification of certain expenses in nature of variable consideration to revenue for June 2018 quarter. We believe that investors should approach the company directly to get clarification about these aspects of the declared results. 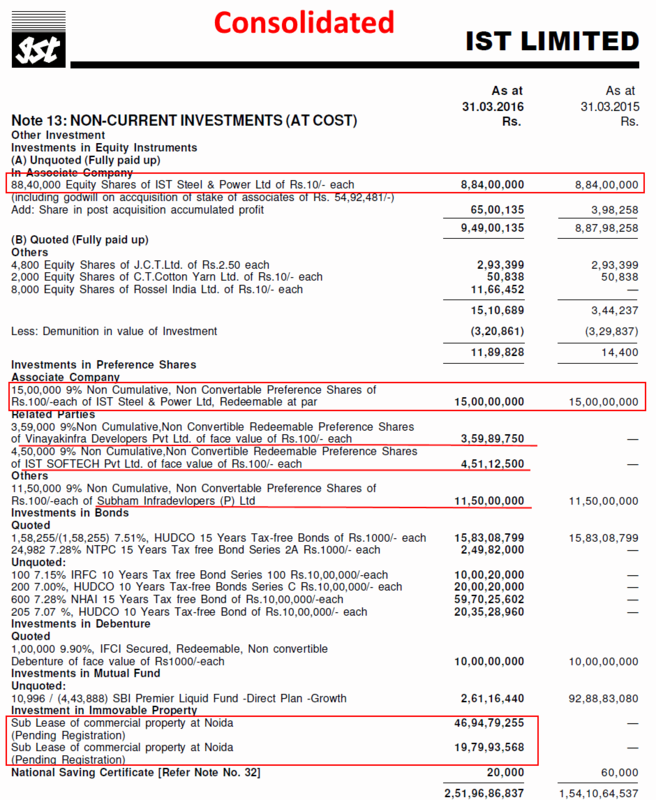 I compared standalone and consolidated figures of P&L of last few years of Indian Toners & Developers Limited from screener and it seems that company is shifting its business from Indian Toners & Developers Limited to its subsidiary company where it has only 51% stake and rest is with the promoters. This can be one of the reasons why market don’t want to give high P/E to this company. Correct me if I am wrong, as I don’t know much about the accounting treatment of subsidiary companies in income statement. I think consolidated income statement is prepared with only 51% of figures of subsidiaries. You are right that in case market notices that promoters are using the listed company as a means to further their personal interests, at the cost of public shareholders, then market gives it lower multiple or P/E ratio. You are right that according to current accounting rules, a company needs to consolidate all assets, liabilities, revenue etc. for entities where it has majority shareholding. Standalone vs Consolidated: which PE Ratio to use? Thanks for excellent Analysis on MRF Ltd. I have a doubt\ with regards to price to earnings (P/E) ratio mentioned in the analysis. The P/E ratio mentioned is 17 which is the standalone P/E ratio. You have said several times that we need to always analyse consolidated figures. While considering consolidated figures, the P/E ratio of MRF Limited comes to 12 (as per Screener). Which P/E ratio should we consider for MRF Limited: standalone or consolidated? We prefer to use the consolidated financials over standalone financials. Therefore, we believe that PE ratio based on consolidated earnings should be preferred over the PE ratio based on standalone earnings. In the case of any discrepancy between the P/E ratios from different sources, it is advised to calculate the P/E ratio on your own. All the requisite data is easily available: market capitalization is available at NSE/BSE websites and the PAT is available in the financial results. With this we have come to the end of this article illustrating the use of standalone vs consolidated financials. It would be a great pleasure to have your views about it. Do you prefer to use standalone or consolidated financials in stock analysis? You may share your thoughts about usage of standalone vs consolidated financials in the comments below. Currently, I do not own any of the stocks of the companies mentioned above in my portfolio.